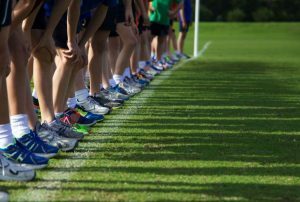 During specific preparation and pre-competitive training periods there is a tremendous amount of work to be done to achieve future competitive season fitness for the middle distance runner. These two blocks of time are also the most crucial for including a close monitoring of workload by the coach in regard to under-recovery challenges. Middle distance coaches have many competitions to fit into the track & field meet schedule beyond the work sessions at this time as well. Considering this, today we will discuss the value of using the 6-5-4-3-2 workout in middle distance training. One of the least desirable approaches is to do too many work sessions that require 48 to 72 hours to recover from. With so many training things to do, and so many meets to compete in, recovery sometimes takes a backseat. This is a recipe for danger. For this reason, a longer microcycle is so desirable for middle distance training, as it allows time for everything to be done before the workouts began repeating themselves in the next microcycle. Workouts that build the highest lactate levels, or keep the system under a higher than threshold acidosis level for a long time, require the most time to recover from. For that reason, the workout that is prescribed better pack some punch to deliver the stimulus needed for adaptation as the athlete recovers during this time of the year. Middle distance coaches constantly seek these workouts. Some of the most stressful work sessions for middle distance runners are those that cross between Special Endurance 1 and Special Endurance 2 workout types. While this hybrid style of work is not recommended for runners in the novice training group, those runners in the emerging and experienced groups will find great adaptation if done at least 20 days out from the most significant competitions. Milers and 800 meter runners with training ages of more than two years will find the double-variable aspect of the following demanding workout to be especially effective if done in the portions of the macrocycle that characterize high levels of work. This hybrid workout is called the 6-5-4-3-2 work session because the demanding aspect of the unit are run at those distances – 600 meters, 500 meters, 400 meters, 300 meters and 200 meters. The athletes go through the cycle twice per session for a total volume of 4000 meters of fast running for the day. Combined with 4000 meters of slower, recovery-style jogging, makes a total for the day to be 8000 meters for this work unit. Adding in a 5000 meter warm-up and a 3000 meter cool down makes a grand total of 16,000 meters for the entire training session, or about 10 miles. This workout is called a double-variable training unit because there are two aspects of the session to consider, emphasize, time, and include in the athletes’ profile. The first design aspect are the times prescribed and run by each athlete in the various repetitions of work. Because the prescribed work is anaerobic in nature, the prescribed times need to be based on their individual anaerobic capacity. For example, let’s set up a workout for a miler that owns a current date 55 second 400 meter time. In data that can be used for this workout, that pace is the same as 0.13 seconds/meter. The athlete cannot run 600 meters at 400 meter pace of course, nor can they sustain anything near date pace 400 meters for much of the total workout. So, let’s have this athlete run at 80% of their 400 pace or 0.16 seconds/meter which will be the pace for all the various repetitions of this specific workout (about 64 sec pace). These are known as intensive intervals because of the percentage they are run at. The math, using the aforementioned 0.16 seconds/meter would be: 600 meters = 1:36, 500 meters = 81 seconds, 400 meters = 64 seconds, 300 meters = 49 seconds, and 200 meters = 32 seconds. Like any prescribed interval work this session is nothing without the recovery period necessary to achieve these times as the unit unfolds. For the first time doing this workout in each macrocycle, rather than set a timed recovery interval, have the athlete use a slow jog equal to the just completed repetition distance (i.e. run 600 meters hard then jog 600 meters, run 500 hard meters then jog 500 meters and so on). Have the jog recovery a sensible pace and not what looks like a fast walk. Once the athlete has progressed through the ladder once, have them start again on the second half of the ladder. This would be another 600 meter (following the recovery from the 200 meter effort) and then just finish repeating the descending distances and the recovery jogs. The coach should monitor each of the ten fast efforts from both portions of the ladder and compare with the prescribed goal paces that were set beforehand, and also from previous data accumulated from this workout in the athlete profile. How well the athlete handles each of the ten segments is the first statistical variable of this workout. The second variable for the coach to analyze is the total time used for the entire workout – start to finish. For this data, use a second watch and start it when the runner begins the first 600 meters, keep it running throughout, and then stop the watch after the final 200 meter jog recovery. The goal is to get a little faster total time each time the workout is done. Some of this time will be from a slightly faster hard effort pace as the runner gains fitness, but most of the time improvement will come from faster jog recoveries while still maintaining target goal pace. For example, the first time it is done by a good middle distance runner in the spring, the entire work unit may take 42 minutes start to finish. The next month it may be down to 40:30 and so on. By the end of the runner’s career it may be down to 37 minutes for the entire 8000 meters. Doing it in less time, while still maintaining pace, is an important aspect of this workout. Finding new workouts for middle distance runners is difficult. Not only must the workout be specific to the event, but also individualized to the athlete. The 6-5-4-3-2 workout satisfies both requirements. Middle distance runners can benefit from a strength program that not only improves performances but also helps keep them injury free. Matthew Ludwig, SCCC, CSCS, is an Assistant Strength and Conditioning Coach at the University of Washington. He can be reached at: [email protected]. Last year, I was given the job of creating a strength and conditioning program for our middle distance runners here at the University of Washington. I quickly learned that the task had a few built-in challenges. Most middle distance runners haven’t spent much time in the weightroom, and many of them are skeptical, thinking that strength training will bulk them up and cause more harm than good. In addition, many middle distance runners compete in both outdoor and indoor seasons, so soreness and overuse injuries are always a concern. I set to work designing a program that would get our middle distance runners excited about strength training, improve their performance, and help keep them injury-free. They responded by bringing home NCAA Division I outdoor titles in the men’s 800 meters and the women’s 1,500 meters. One of the keys to our program’s success has been starting off carefully and building a solid foundation. Another has been open communication between myself and Head Track and Field Coach Greg Metcalf, to ensure that the work we do in the weightroom complements the training athletes do on the track. In this article, I will outline our strength and conditioning program for middle distance runners, and detail the logic that went into its design. Make it doable. We wanted to develop a program that would keep our runners coming back for more. The greatest strength-training programs ever written are the ones that get done! You can pour your heart and soul into a training program, but if the sport coach does not support it or the athletes give minimal effort, you will get minimal results. Therefore, we keep it very simple in our weightroom and rely on the principle of progressive overload to establish strength throughout full ranges of motion. Shin splints, knee pain, foot and ankle pain, calf and achilles pain, and hamstring and low back pain are common in middle distance runners because of the high volume of impact on their lower bodies. Athletes who are hurting aren’t going to be motivated to keep coming back, so we monitor muscle soreness and adjust our program accordingly, and we talk to the athletes often to find out how they are feeling. The more we show we care about them, the harder they work for us. Establish a base. Many middle distance runners are unfamiliar with the weightroom, oftentimes because strength work isn’t stressed and because of misconceptions that lifting weights generates hypertrophic muscles that will make them look like football players. We explain to our runners that science has shown many times over that being involved in an organized strength-training program promotes muscle balance, enhances metabolic adaptations, and improves force production, joint stability, performance output, recovery rates, flexibility, structural stability, and motor development for improved balance. To receive these benefits, they first need to establish a base. Our program for middle distance runners consists of two or three workouts a week lasting 45-60 minutes each depending on the time of year. Improve flexibility. Any time a muscle repetitively performs an action in a limited range of motion, it gradually becomes limited to that range of motion. Distance runners run straight ahead and rarely utilize their full stride length with maximal hip flexion and hip extension. Consequently, they end up with tight hamstrings, hip flexors, glutes, calves, internal and external hip rotators, and backs. Incorporating static, dynamic, and PNF stretching into a runner’s training program can have astounding results. Our athletes always come to the weightroom after they have trained on the track, so we don’t have to spend time warming up. Instead, we focus on improving flexibility. As one form of dynamic flexibility training, we train every movement in the weightroom using the fullest range of motion possible. We finish the workout with static flexibility training and a PNF (contract-relax) program using elastic bands. Improve core strength. To build core strength, we believe it is most important to teach the athlete to move their limbs throughout a full range of motion in space before introducing balls, gadgets, and other resistance- or balance-manipulating devices. Although these are all great tools for training, we take the time to first generate motor unit recruitment in the core through sport-specific movements like squatting, pulling, lunging, and steps-ups. In addition to these exercises, we incorporate weighted abdominal work, physioballs, and static abdominal work. Stweak and lagging muscle groups. Although middle distance runners use their legs for most of the work they do, a large portion of their lower extremities are often underdeveloped. Common areas of lower body weakness in middle distance runners include hamstrings, hip flexors, hip abductors, and hip adductors. Most middle distance runners also display some level of weakness when asked to perform any unilateral exercise. Upper-body weaknesses typically consist of weaker posterior chains compared to their anterior counterparts. Therefore, we focus our program on strengthening these muscle groups to avoid imbalances. After we gather information through our needs analysis, it is time to get athletes into the weightroom for preseason conditioning. 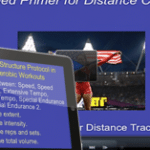 Simply introducing a training program for middle distance runners, as easy as it sounds, has proved to be more challenging than I originally thought. Track athletes at the University of Washington are very in tune with their bodies, and know two things: “The better I feel, the better I will run,” and “the stronger I am, the faster I will run.” This influences my approach to their training. We begin by introducing basic movements to establish an understanding of the motor development the athletes currently possess. Muscle soreness has to be very limited as to not have a detrimental effect on performance. We know the first four weeks of learning a new exercise are mainly neurological, but if the muscles are being asked to perform in an unfamiliar range of motion, the risk of micro tears increases. Remembering another of our goals, to create a training program that keeps our runners coming back for more, we are careful to not get overzealous on day one. You can always add to a program, but it is extremely difficult to undo overreaching in a short amount of time. I start with very low volume and very low intensity and slowly raise the volume from week to week. I don’t progress the athletes to more volume or more intensity until I feel they have established a sound comfort level with the load they are initially assigned. For example, when introducing squats, we start with sissy squats holding a 10-pound plate across the chest. Sissy squats allow the athletes to keep their torsos in an upright position, and promote maximal range of motion without limitation. Hamstring strength for distance runners tends to be very weak after the first 45 degrees of hip flexion. By placing the athletes in a position to use the quads and get maximum depth, we build up to performing a back squat. Week one consists of the following exercises to begin strengthening the lower body. Each exercise is performed with one minute of rest between exercises and sets. Body weight step-ups: Two sets of five on each leg using 90 degrees of hip flexion (focus on using glutes and hamstrings for hip extension). Standing single-leg hip flexion with knee extension: One set of eight each leg. Hanging knee-ups: Two sets of 10. Sissy squat: Three sets of 10 reps. Body weight step-ups: Three sets of eight reps on each leg. Standing single-leg hip flexion with knee extension: Two sets of 12 reps each leg. Hanging knee-ups: Three sets of 15 reps. Using this program over the first five weeks of their training in 2005-06, our athletes improved their overall ability to do work from the original baseline in week one of 53 reps to 123 total reps. During the five weeks, the load never changed. This is a very basic approach to improving general physical preparedness and diminishing recovery time. The training year for our middle distance runners is divided into six mesocycles: off-season, preseason, transition, in-season, transition, and postseason. Below is a detailed look at a year-long macro cycle and how we have designed the strength-training program for each phase. Off-season (mid June to September): We conduct two full-body workouts per week, Monday and Thursday. This training cycle focuses on recovery, restoration, and repair from the high-intensity loads experienced during the season that just ended. The athletes cut back on the majority of total running volume in June and gradually increase from July to September. Strength training focuses on building strength endurance starting in week one of the off-season program with a total volume of 298 reps (excluding core work) per week and building to 520 reps by week 18 (see “Off-Season Conditioning”). Many of our middle distance runners compete in outdoor competitions in September and October, so we try to enhance both their ability to metabolize lactate and their metabolic response to training by improving oxygen consumption and fuel utilization. Preseason (October to mid December): We progress to three full-body workouts per week. Training is now focused more on improving overall muscle strength and forcing production in preparation for the indoor/outdoor seasons. During this time period, the athlete’s volume stays at or under 120 total reps per workout (excluding core work). Set and rep ranges consist of two to four sets of five to 12 reps, depending on the exercise being performed. Athletes also spend more time with their sport coach working on their running economy and efficiency and building cardiovascular endurance. In-season (January to May): We go back to two full-body workouts per week. The inseason is long and hard for our middle distance team, which competes in both indoor and outdoor events for five solid months. We perform two workouts per week on Mondays and Wednesdays to allow for full recovery in time for weekend events. During this time, the weightroom is more of a tool for active recovery and restoration, maintaining flexibility, and prehab or rehab work. In-season is a time of specified training on the track and the intensity must be high at every practice. Transition (one week in May): Athletes are off from training for one week to allow a mental and physical break. This is a time for those who are competing in conference, regional, and national events to freshen up mentally and disengage for a brief period. Postseason (second week in May until nationals): Weightroom activities are voluntary during this time, but flexibility training after every track practice is strongly encouraged. Throughout the season, we strive to improve communication between myself, Coach Metcalf, and our athletic trainers. Each person involved with the progress of our athletes needs to be on the same page. The success of our program revolves around open communication. As a staff, we meet weekly to discuss current injuries, practice plans, and each athlete’s progress in the weightroom. This ensures that we avoid overtraining and that we utilize the knowledge of our sports-medicine staff to help validate our training plans. We also revisit our overall needs analysis at least twice a year, once before the indoor season and once at the conclusion of the outdoor season. Our program at the University of Washington works very well for us and we are proud of the athletes who have dedicated themselves to it. When a middle distance runner steps on the track for competition, they know they have trained hard and can compete to their fullest ability. During the off-season, our middle distance runners complete two strength-training workouts per week. Listed below are the exercises performed on each day, along with the reps and sets performed on Week One. To see a copy of the complete 18-week program, visit: http://huskystrength.ica.washington.edu. The physiological concept of anaerobic speed reserve (ASR) is a relatively new concept to middle distance running. ASR is defined as the difference between an athlete’s absolute maximum velocity and their maximum aerobic speed (vVO2 max). The anaerobic/aerobic energy system contribution percentages for a sprint event of 400 meters or shorter is much different from an endurance event of 800 meters or longer. The difference largely determines the success a specialized athlete may have at various events above or below the lactate threshold (LT). 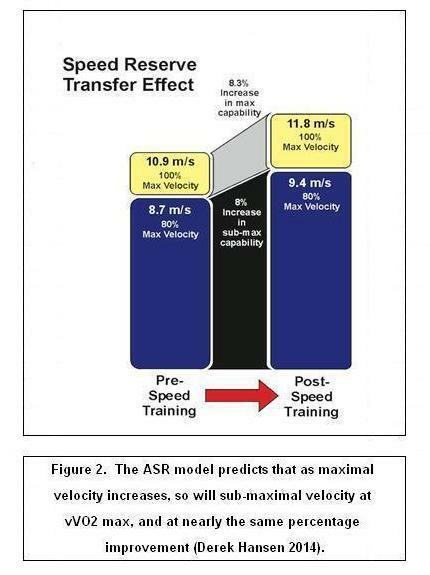 The importance behind the ASR model is simply that faster top-end velocity precedes faster sub-maximal aerobic speed. Elite sprinters achieve racing speeds that are twice as fast as elite milers, but elite marathoners race only moderately slower than milers (Figure 1). The disparity lies in the metabolic power available from the anaerobic sources in these faster athletes. Knowledge of the top-end velocity and the maximum aerobic speed can thus aid in predicting and analyzing performance at any event duration between three seconds and four minutes with the use of the ASR model. Speed is the name of the game in just about every aspect of athletics and this includes middle distance and distance running. Many endurance coaches spend far too much training effort extending the workout distance by which a middle distance athlete can comfortably run at the expense of how fast the runner is at absolute maximum velocity. Middle distance events do have a higher aerobic energy system contribution than anaerobic energy contribution, but there has to be a balance of training that addresses both physiological domains. The ASR training model stresses the importance of improving absolute maximum velocity in improving the overall performance of middle distance racing efforts. Put simply, the research suggests that if maximum 30 meter time measurably improves, then performance will predictably improve in both the 800 meters and 1500 meters. Many studies suggest that improvement in 30 meter time actually extends all the way out to predictable 10 kilometer time improvement as well. The most effective way of improving absolute maximum velocity is to do work sessions of both alactic 30 meter fly work and speed endurance work that is slightly longer. Speed endurance sessions are near maximal work done between 60-150 meters in length. A workout of five times 100 meters with five to six minutes recovery time between should be sufficient. Doing these on the fly is not necessary, but timing them is. These are not strides done at the end of practice. This is very fast work done at the start of practice after a sufficient warm-up. Alactic work should be done in every middle distance microcyle whether in-season or during winter and summer general preparation. Speed endurance is found in every microcycle of both the specific preparation and pre-competition periods. The ASR training model predicts that as maximum absolute speed improves in a measureable way (meters/second), then sub-maximal speed will improve at nearly the same corresponding percentage (Figure 2). The middle distance runner who covers the most meters per second on average over the entire race will win. Yes, this involves aerobic development, especially as the runner gets deeper into the race as they are trying to maintain their velocity, but it also is heavily dependent on the anaerobic energy concept of just getting maximally faster. Coach Christensen offers several great coaching tools. 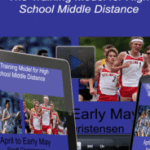 His Training Model for High School Middle Distance is a great one. Just click the link to learn more. 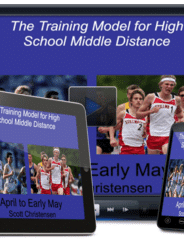 This course provides you with every 800m-1600m workout for the entire season. 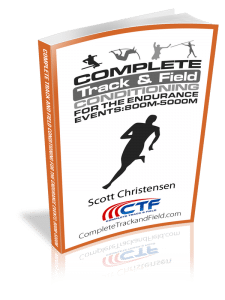 This post was provided by Complete Track and Field, a tremendous resource for track and field coaches. Training distance runners is similar to other rewarding endeavors in life in that it seems rather daunting to begin with, and then stays challenging throughout. The athletes themselves are in most cases strongly self-motivated, task-oriented, and inquisitive, while the training is based on scientific principles. If the coach is not a strong people-person and well-schooled in science, the learning curve can be steep. Important in this process are the workout planning fundamentals. For these reasons a good distance coach cannot be just a good distance runner themselves, but more importantly a person eager to learn and apply scientific theory to the development of interesting, effective, and sequential training workouts and schemes. All mainstream distance races from the 800 meters to the 10,000 meters are characterized by having a comfort zone component and a critical zone component to them. The former is approximately the first three-fourths of the race and the latter is usually the last one-fourth of the distance. The comfort zone is mainly aerobic in nature and is influenced heavily by the runners’ individual ability to handle and utilize oxygen from the moment these once atmospheric molecules leave in the blood from the heart, until they are actually used during aerobic respiration in the mitochondria of the muscle cells. The critical zone is mainly anaerobic in nature and is influenced heavily by the runners’ individual ability to tolerate increasing levels of both hydrogen and lactate ion build-up in the blood and inter-cellular fluids of the body. Both the comfort zone and critical zone must be trained to their fullest extent if a distance runner is to be successful. The aerobic energy system is most effectively trained with continuous run workouts that are paced at velocities slower than race pace, but with a distance that is longer than the race. These are the typical workouts that all distance coaches prescribe for their endurance athletes. For example, 800 meter runners need 4-5 miles of continuous running, milers need 6-7 miles, and two-milers and five kilometer runners need 8-10 miles of frequent continuous distance to be considered skillful. However, a runner cannot start with theses distance in training. The coach needs to bring increasing distance along slowly. The benchmark starting point is usually three miles of continuous effort at the start of a season. 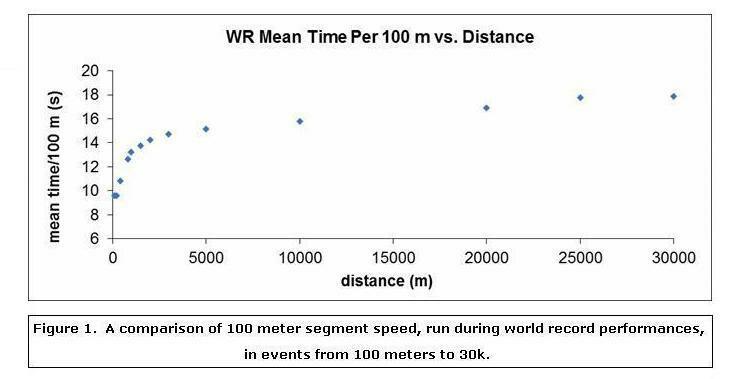 How quickly a runner can get consistent at the mentioned continuous efforts for the desired racing distance depends on the strengths, weaknesses, and experience of each person. Aerobic energy system training also varies by velocity as long as it remains slower than race distance pace. Long and short easy runs make up much of aerobic training. Runs are considered easy if the athlete can maintain a conversation during the effort and they seem to recover in 24 hours. Occasionally, it benefits the endurance athlete to run a distance workout faster than easy. These workouts vary from aerobic power (VO2 Max) training sessions to tempo run sessions. The former are workouts paced around the athlete’s current maximal two-mile pace and are usually done interval style, while the latter is a more powerful continuous effort than the long, easy runs. An example of an aerobic power training session might be four repeat miles done at the athletes current two mile pace (ex. 10:00 two mile = 5:00 mile pace) with the rest interval about the same as the work time. An example of a tempo workout might be 25 minutes of continuous running at about their pace for an estimated all-out 8-9 mile effort. Both the aerobic power workout and the tempo run require a 48 hour recovery before a hard aerobic effort can be repeated. What would be done the next day? Perhaps, a short easy run, or some hill repeats, or perhaps something hard but short on the track with extensive recovery between work bouts would all be good choices. The anaerobic energy system is most effectively trained with interval or repetition run workouts that are paced at velocities faster than race pace, but with a work distance that is shorter than the race. In many cases the total work distance for the day adds up to about the race distance, but with the many breaks between work bouts the athlete is able to run fast for all of the efforts. These workouts are introduced early in the season but do not become a frequent component of the weekly scheme until the athlete is about eight weeks from their championship race. Early in the season the ratio of aerobic to anaerobic workout days should be about 5 to 1. Six weeks away from the championship race it is 4 to 1, and in the two weeks leading up to the big race the ratio is 2 to 1 aerobic to anaerobic based days. 2). the workout pace deteriorates throughout the session. Generally, the season is divided into thirds with the first third following point 2, and then the middle third following point 1, and then the last third back to point 2 again. Ultimately, it is the coach that causes all of this to happen for that is the person that controls the rest interval between work bouts within a session. With that in mind, during the first third of the season the rest should get longer within the workout to maintain velocity, during the middle third of the season the rest is held the same to cause the velocity to deteriorate as handling fatigue is the focus, and in the last third of the season the rest remains the same, but it is longer with fewer bouts of running within the session to keep the work very intense. An examples of anaerobic work that might be done early in the season might be five repeats of 400 meters done about five seconds faster than estimated current one mile race pace, with interval rest gradually getting longer to maintain this pace (ex. 3 minutes extending to 4:30). Or, it might be seven times 200 meters at ¼ of their estimated current 800 meter time with gradually increasing rest to maintain that pace. Examples of mid-season anaerobic work might be eight times 400 meters holding steady at three minutes rest between bouts of work. Velocity of the work might be four seconds faster than estimated current day one mile race pace. Or, it might be two sets of three times (six total) 300 meters with two minutes rest between repetitions and four minutes between the two sets. Velocity might be two seconds slower than estimated current 800 meter pace. Examples of late-season anaerobic work might be three times 500 meters with eight minutes rest between work bouts basically going as fast as one can. Or, it might be two times 600 meters with 12 minutes rest between work bouts with the velocity done as fast as one can. Developmental improvements in both the comfort zone and critical zone must be the focus of all distance running training schemes. In some cases much of the aerobic development can be done in the off-season by a dedicated runner or the whole distance squad. That really frees time up to work unhurriedly into the anaerobic development of the runner which should be done under the coaches’ direction. Speed Endurance training sessions are just a bit slower than maximum speed efforts. Training sessions that target Speed Endurance stimulate the body’s energy and muscular systems to carry a very fast velocity to near exhaustion. Learn more about Speed Endurance training in this post. Coach Christensen has over 30 years experience as Head Coach at Stillwater HS, Minnesota. He is four year Lead Instructor in Endurance for the US Track & Field and Cross Country Coaches Associtation (USTFCCCA). Four Stillwater alumni have broken 4:00 in the Mile since 2003. He was the USA World Cross Country Team Leader (2003 & 2008) and in 1997 he coached the High School National Champions. The middle distance events in track and field have a sizeable anaerobic energy system contribution when the distance is done to exhaustion. The percentage of anaerobic contribution varies from 50% in the 800 meters to 80% in the 1600 meters. Because the energy contribution is so extensive, many training sessions need to be implemented during the track and field macrocycle to properly train and develop the mechanics and pathways of the system. In sprinting terminology, maximum effort is tied to maximum speed. Many studies have shown that maximum speed in an athlete can only be maintained for 60-80 meters before fatigue deteriorates performance. There is considerable benefit in year-round, balanced, multi-lateral training where all runners, including middle-distance athletes, never get far from continued development of the primary training component of maximum speed. As maximum speed gets faster in an athlete, so do the anaerobic components which facilitate that energy delivery process. Since maximum speed can only be maintained for 60-80 meters, it is realistic to conclude that all standard track races, including middle distance races, are run at sub-maximum speed if done to exhaustion. While it has been shown that frequent training stimuli of maximum speed work makes all runners “faster”, it has also been shown that frequent training at a fractionalization of maximum speed values improves sub-maximum performance. Training theory states that he faster the race, the greater the need for sub-maximum training stimuli closer to the maximum speed ability of the runner. Middle distance racing is done at a sub-maximum speed. Logically, middle distance racing pace is just a bit slower then the pace sprinters use to complete a 400 meter effort. Because of the pace demands of a middle distance race, training theory calls for frequent work sessions that are at a high fractionalization of maximum speed (Table 1). Work done at the listed efforts provides the stimulus for development of the metabolic and muscular pathways needed to maintain a fast middle distance race pace. It is suggested that each of the three fractionalized modalities be part of a twelve day training microcyle during the specific preparation and pre-competition periods of the track macrocycle. Special Endurance 1 and Special Endurance 2 training sessions are commonly done by middle distance runners during the track microcycle. The most often done work being interval-style repeats of 200 meters and 400 meters. Frequently, coaches wait too long to implement them into the training scheme. The time-frame for complete development of the anaerobic energy system is 10-12 weeks, so a coach cannot wait too long to bring this type of work to the runners. The anaerobic training modality not often seen in middle distance training programs is called Speed Endurance. These are training sessions that are just a bit slower than maximum speed efforts. Training sessions that target Speed Endurance stimulate the body’s energy and muscular systems to carry a very fast velocity to near exhaustion. This type of work is among the most technical efforts that a middle distance runner can do, so it is the role of the coach to mark the track (or grass course) so that elapsed time can be aligned with the exact distance in setting up and evaluating the work. As in all anaerobic work, the coach plays the key role of regulating intensity of effort. This is done by regulating the level of recovery between bouts of work. Speed Endurance work requires relatively long recovery intervals. Speed Endurance 60 meters to 150 meters @ 97% max effort [Example] 2 sets of 4 reps of 120 meters. 6 minutes rest between. Special Endurance 1 150 meters to 300 meters @ 95% max effort [Example] 2 sets of 3 reps of 200 meters. 4 minutes rest between. Special Endurance 2 300 meters to 600 meters @ 92% max effort [Example] 1 set of 4 reps of 500 meters. 3 ½ minutes rest between. Table 1. Work sessions that target the anaerobic energy system. The correct implementation of a Speed Endurance training session is as follows. With a measuring wheel and can of spray paint, mark a dot on the track exactly 150 meters from the finish line. 2 mile very active warm-up. Strides. Basically, race day preparation. Extent of work is 4 * 150 meters on the track at max effort. Use a starting device. Rest is 6 minutes between. Time goal is their date pace 400 meter time multiplied by .35. 3 mile easy run @AT. Be very careful with this workout. It is more than just strides because it is done as the first unit in the session. Very light static stretch followed by 2 mile active warm-up. Then 1 mile of additional mixed intensive striding and jogging. 7 x 140 meters fast on grass. Use a starting device for an exact start and good acceleration from a crouch. 6 min rest between.